Donald and Barbara Bray will be your host on one of the most exciting hunts you will ever go on. Expect to see over 40 Bull Tahr a day to choose from. The property is over 12,500 acres with some world class Himalayan tahr and Chamois. about our Lilydale Wilderness Area - Himalayan Bull Tahr and Nanny Tahr Combo package. This third generation landowner will guide you thru his alpine estate for a hunt for all fitness levels. Lilydale Wilderness Area is alpine terrain situated at 2,500 to 7,600 feet above sea level. We have designed this to be an all inclusive package giving each hunter a door-to-door experience. 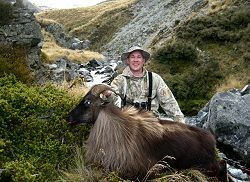 This hunt includes both a trophy Bull Tahr as well as a Nanny Tahr, as the nannies grow horns out to almost 9 inches long. This property has ideal habitat also for Chamois from in the 9 to 10 inch range as well as trophy Fallow Deer and Arapawa Rams. If you are successful in harvesting your Bull and Nanny you may add additional species on a trophy fee basis. To add a Chamois would be just $2250 USD, $1500 USD for a trophy Fallow Buck and $600 USD to add an Arapawa Ram. Should you wish to extend your hunt you can add additional hunting days to ensure you are able to harvest the additional animals that you are after for just $500 USD per guided hunting day. Your accommodation will be at the rustic lodge located in the middle of the hunting grounds with a spectacular view over the Southern Alps. Read more about and see photos of the Lilydale accommodations. Download our flyer for Lilydale Wilderness Area hunting packages.